Peptide sequence is < 50 % identical to other human chemokine receptors in this region. , corresponding to amino acids 17-39 of Human CCR4 (extracellular domain). Human peripheral blood cells or paraffin sections of spleen. IHC-P:FFPE mouse lymph node normal. IHC-P:FFPE human tonsil normal. IHC-P:FFPE rat spleen normal. Our Abpromise guarantee covers the use of ab1669 in the following tested applications. 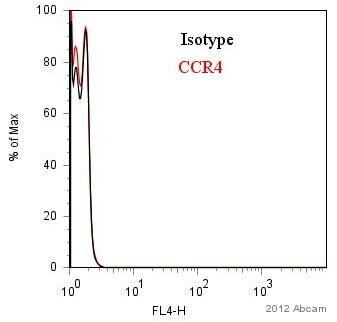 ICC/IF Use at an assay dependent concentration. Fix cells with 4% PFA (see Ritter et al). WB 1/1000. Detects a band of approximately 55 kDa (predicted molecular weight: 42 kDa). 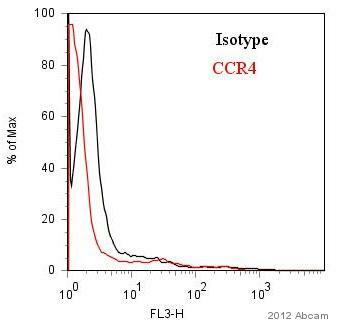 IHC-Fr Use at an assay dependent concentration. Fix in acetone at -20°C for 5 minutes. See Heller et al. Predominantly expressed in the thymus, in peripheral blood leukocytes, including T-cells, mostly CD4+ cells, and basophils, and in platelets; at lower levels, in the spleen and in monocytes. Detected also in macrophages, IL-2-activated natural killer cells and skin-homing memory T-cells, mostly the ones expressing the cutaneous lymphocyte antigen (CLA). Expressed in brain microvascular and coronary artery endothelial cells. In natural killer cells, CCL22 binding induces phosphorylation on yet undefined Ser/Thr residues, most probably by beta-adrenergic receptor kinases 1 and 2.
ab1669 staining CCR4 in Mouse whole blood by Flow Cytometry. Red blood cells were lysed in PBS + 1% BSA and 0.01% sodium azide and fixed in paraformaldehyde. 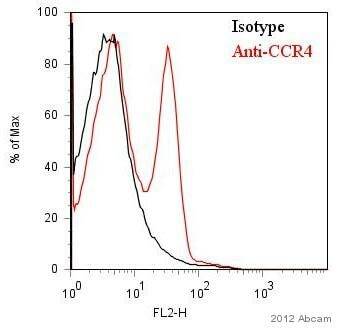 The sample was incubated with the primary antibody (1/100 in PBS + 1% BSA and 0.01% sodium azide) for 1 hour at 4°C. A biotin-conjugated Donkey anti-goat IgG polyclonal (1/200) was used as the secondary antibody. IHC image of CD3 staining in a formalin fixed, paraffin embedded normal rat spleen tissue section, performed on a Leica Bond™ system using the standard protocol F. The section was pre-treated using heat mediated antigen retrieval with sodium citrate buffer (pH6, epitope retrieval solution 1) for 20 mins. The section was then incubated with ab1669 at 1/100 dilution for 15 mins at room temperature and detected using an HRP conjugated compact polymer system. DAB was used as the chromogen. The section was then counterstained with haematoxylin and mounted with DPX. Frozen sections of human skin tissue stained for CCR4 using ab1669 in immunohistochemical analysis (green). CD31(red) and nuclei (blue) are also shown. The right hand panel is a merged image. Image courtesy of PMID 25915746 (PLoS One 2015 Apr 27;10(4)). IHC image of CD3 staining in a formalin fixed, paraffin embedded normal human tonsil tissue section*, performed on a Leica Bond™ system using the standard protocol F. The section was pre-treated using heat mediated antigen retrieval with sodium citrate buffer (pH6, epitope retrieval solution 1) for 20 mins. The section was then incubated with ab1669 at 1/100 dilution for 15 mins at room temperature and detected using an HRP conjugated compact polymer system. DAB was used as the chromogen. The section was then counterstained with haematoxylin and mounted with DPX. IHC image of CD3 staining in TISSUE formalin fixed paraffin embedded tissue section, performed on a Leica Bond™ system using the standard protocol B. The section was pre-treated using heat mediated antigen retrieval with sodium citrate buffer (pH6, epitope retrieval solution 1) for 20 mins. The section was then incubated with ab1669 at 1/100 dilution for 15 mins at room temperature and detected using an HRP conjugated compact polymer system. DAB was used as the chromogen. The section was then counterstained with haematoxylin and mounted with DPX. 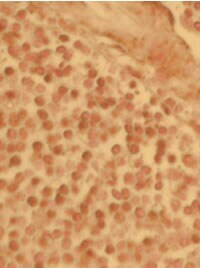 Immunohistochemistry using ab1669 on a section of human spleen. IHC image of CCR4 staining in human spleen formalin fixed paraffin embedded tissue section, performed on a Leica BondTM system using the standard protocol F. The section was pre-treated using heat mediated antigen retrieval with sodium citrate buffer (pH6, epitope retrieval solution 1) for 20 mins. The section was then incubated with ab1669, 5µg/ml, for 15 mins at room temperature and detected using an HRP conjugated compact polymer system. DAB was used as the chromogen. The section was then counterstained with haematoxylin and mounted with DPX. For other IHC staining systems (automated and non-automated) customers should optimize variable parameters such as antigen retrieval conditions, primary antibody concentration and antibody incubation times. Additional bands at: 100 kDa, 37 kDa. We are unsure as to the identity of these extra bands. CCR4 contains a number of potential glycosylation sites (SwissProt) which may explain its migration at a higher molecular weight than predicted.